Carpet and wood flooring are the two most popular flooring choices across the world. Carpet and wood flooring are the two most popular flooring choices across the world. Home and business owners have their reasons for choosing one or the other. At Jason Brown Wood Floors, we happen to think that wood flooring is clearly the best choice and here’s why! If your little one spills grape juice on your carpet, you’re probably going to spend a really long time scrubbing it out. Carpet fibers trap all sorts of things, including everything from juice, to mud, bacteria, dust, and more. You’d have to vacuum several times a day to get a fraction of it out! Wood flooring, on the other hand, can simply be wiped clean. It’s much easier to see when there is dust or anything else collecting on the hardwood. Wiping dust away with a dust mop is way easier than fighting with a vacuum cleaner! The static electricity created by the friction of people walking on carpet means that the fibers will literally attract germs, dust, and other allergens. This is bad news for anyone in your home who suffers from allergies or a compromised immune system. As we mentioned before, this is not something you need to worry about with wood flooring. You simply need to wipe it clean. When properly maintained, your wood flooring will last for generations. Carpet, however, is a different story. No matter how high-quality it is when you purchase and install it, carpeting still needs to be replaced every couple of years. After a while, carpeting will wear out, which only detracts from your home’s appearance. 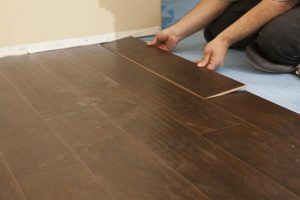 Many types of wood flooring actually start to look better with age. This entry was posted on Friday, April 6th, 2018 at 4:03 pm. Both comments and pings are currently closed.